As seems to be a tradition with just about every American, we took this day after Thanksgiving to drag all of our exterior Christmas decorations and put them up. It didn’t take much for the lights except for finding their proprietary plug since I never took them down last year. I have, however, promised Ann that this will be the year that I do take them down. She doesn’t want us to get some kind of strange reputation around here. But as I dug further, I came across an old OfficeMax ad from 2003. It wasn’t exactly just lying around; it was being used to protect a saw blade from anything that could…potentially damage a saw blade, I guess. 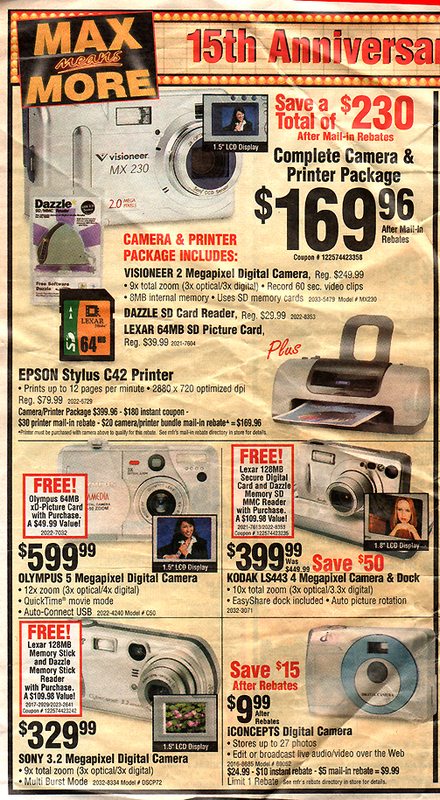 While the bulk of the ad was rather unremarkable in that the products and prices hadn’t really changed to much (like toner for laser printers and reams of paper), there were a few things that stood out. Like the Palm Tungsten with 16MB of memory or the archaic and camera-less cell phones with plans from Sprint that included 2000 Anytime Minutes (and not a word about texting) for $100/month. Hey, in the market for a nifty storage solution? 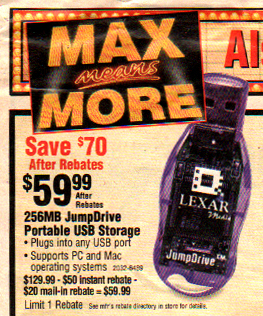 Take a gander at this wonderful Lexar JumpDrive USB drive. It’s got a whopping 256MB of storage and is on sale for $59.99 after two rebates (regular price of $129.99)! Since it was such a great deal, it meant that OfficeMax had to enforce a limit of 1 per customer. Now I remember buying one of these things for Ann when she was in college because they came in really handy for her group projects. One person would do their part, save it to the drive and pass it on to the next person. I think I spent $40 for 32MB. Now I have almost 3GB of free online storage with Dropbox but still have a 4GB USB drive that cost me much, much less than the 32MB or the one shown here. Hey, how about a digital camera? Check out these deals! Click to Embiggen and See the Deals! First of all, who the Hell knew Visioneer even made digital cameras? If they were made anything like the scanner that I used to have then I can see why they no longer make them (although Visioneer is still in the scanner business). How about that spiffy little deal at the bottom that stores 27 images? Might as well stick with a roll of 24-exposure film. But hey, about that Olympus Camedia model? You get all of these amazing features for the incredibly low price of $599.99! Man oh man, I think I spent a little more than that in 2006 for my 8-megapixel Olympus E-VOLT E-500 DSLR kit with two lenses. 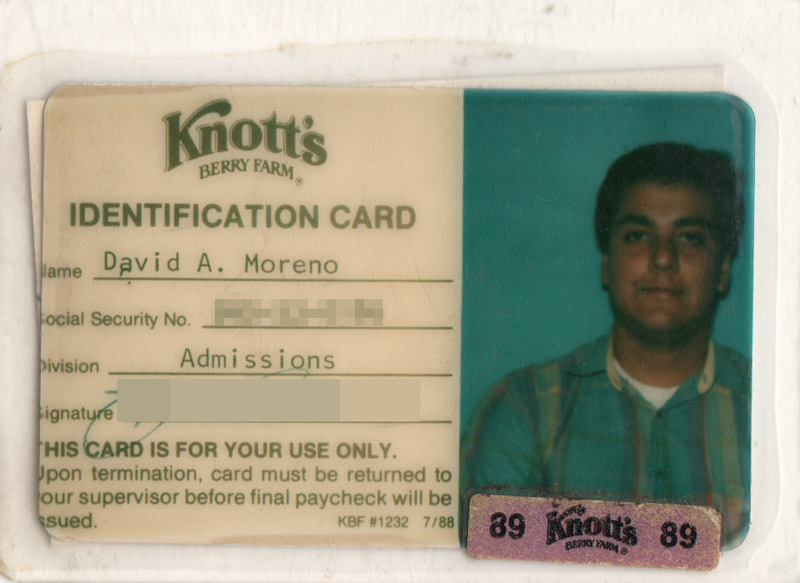 That said, I don’t even want to mention how much I spent on my first computer in 1994. Wait, I already did. No matter how you put it, it really is trippy to see how much technology changes and prices drop in just a few short years, and how what’s new/hot today will be incredibly hysterical to laugh at in the all-too-near future. This entry was posted in Flashback, Hobbies, Technology and tagged 2003, ad, digital cameras, jumpdrive, lexar, officemax, olympus, olympus e-500, Palm Tungsten, Technology, visioneer by Dave. Bookmark the permalink.